A geocache hidden near a series of stone steps in a Morris Plains / Parsippany park. I read about this location in issue #16 of Weird NJ magazine. This cache is accessible via trails or steps. Yes, you read that right. There is a series of stone steps going up the hill. 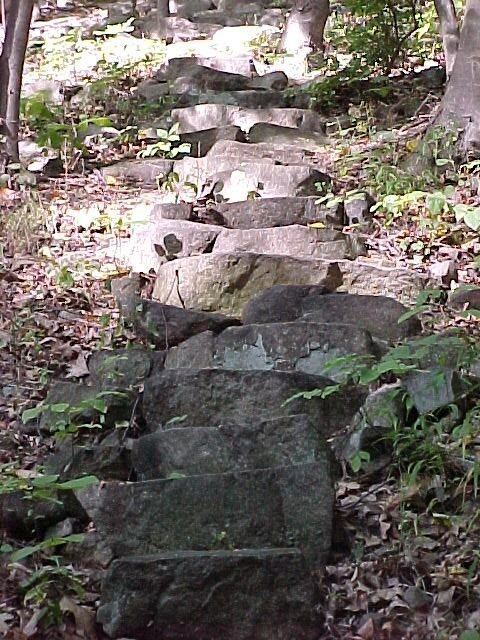 Central to the lot is an extensive set of stone steps, reputedly laid by engineers and/or scouts for General George Washington during the Revolutionary War. They facilitated the climb to the south face of the then denuded top of Watnong Mountain. Here a massive bonfire was laid as a warning beacon to alert American troops in the Jockey Hollow area to any strategic movement undertaken by the British. There seems to be little doubt about the authenticity of the beacon site. Use the parking lot on Mountain Way. The trailhead is across the road from the parking lot / playground. At the first fork in the trail, go to the right. Within fifty feet of the fork, you'll see a small path to your left leading to the stone steps. The start of the small path is marked with stone cairns. The cache is within 200 ft of the top step. You'll see a lot of boulders there. Elevation is approximately 950 ft. The walk should be under 0.2 miles using the steps. The cache is also within 200 ft of the trail. At the first fork, go left for a more challenging climb or right for an easier ascent. The red trail is one big loop. 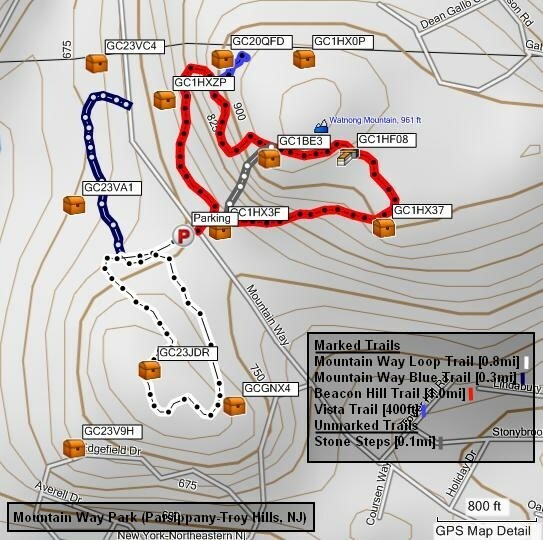 Near the peak, you'll find a short blue blazed trail branching off from the red trail. Follow it towards the power lines for a scenic vista. (not the cache location, however) Getting to the cache should take a bit over 0.5 miles of walking via the red trail. If you get to the cache site via the trail and want to see the steps, the top step is at N40°50.885' W74°29.704'. The EPE was higher than optimal at the cache location so the coordinates I read may be inaccurate. If you're having trouble finding the cache using the given coordinates, please use the hints and pictures to guide your search. The cache is an army surplus 50 cal ammo container hidden under rocks. Please sign and date the log book, and rehide the cache in its original location once you're done. Notes: Log Book #1 and Log Book #2 PDF files created from StayFloopy's original scans hosted at stayfloopy.com. This 190-acre municipal park at the far southwestern corner of the town is also the location of the highest point above sea level in Morris County, Watnong Mountain. The vistas from the mountain were important during the Revolutionary War for signaling, and the detection of troop movements. The posting was then known as Beacon Hill, and for troops of the Continental Army, had a commanding view of much of north Jersey; looking north, east, and south, from its slopes. Though charcoal remnants of the beacons left in the soil (think the movie Lord of the Rings) have long since been displaced by human activity, stone steps up the southwest side of the hill that were built by the Continental Army are still there for climbing and exploration. The Continental Army had plenty of stones to choose from, as the mountain is a classic example of terminal moraine, the geological formation of earth and rock pushed up at the limit of a glacier's advance. 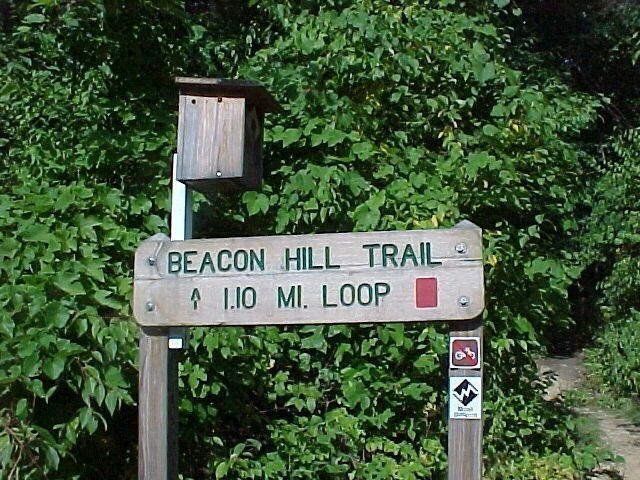 The steps are clearly visible from the southern loop of the 1.1 mile Beacon Hill Trail, as one enters the mountain side of the park from the parking and playground area on Mountain Way, and taking the path to the right. Clearly blazed, other glacial rock outcroppings dot the trail as it circles south, east, and then north, passing west of the base of the water tower at the top of the mountain. Continuing north, a side trail leads to the tree line at the north side of the park, where an overlook provides a broad view of Sussex, Morris, Passaic, and Essex counties. For the spry, a shorter hike jogs to the overlook via the north loop of the trail on the left, but expect a very slight bit of difficulty as you make your way up. The reward for taking this more difficult path is the view of some of the most dramatic outcroppings of glacial boulders, and rockfalls, in the park. Ybbx sbe n gerr jvgu 2.5 gehaxf. (2 gehaxf naq 1 qrnq gehax.) Ybbx sbe gjb ebpxf sbezvat n fznyy gevnathyne nepu arneol. V cynprq gur pnpur gurer naq pbirerq vg jvgu fznyy ebpxf.